Collecting-wise, I have sat out the Bay era of the Transformers. The designs just don’t appeal to me. Why not? The short version is “it’s not what I grew up with.” If you want my tl;dr explanation, read on. If not, just skip to the review below. The first wave of transforming mecha (for simplicity’s sake, let’s just say TF:G1) did something special and new. Its designers reorganized the formal elements of iconic machines, be they sports cars, military vehicles, or household objects, into robots. The vocabulary for the robot forms came from the unique and immediately recognizable design elements of the machines. 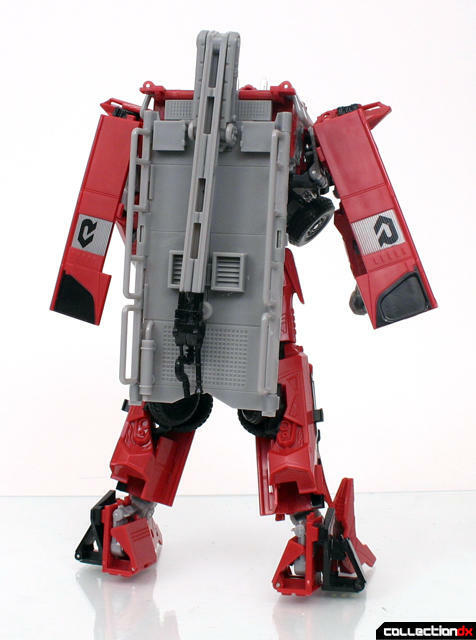 The angular sweep of a Lamborghini Countach hood, the blocky cab elements of a truck, the fuselage of a jet, these features became figural components of a humanoid robot without losing their identity. And because the robots had a clear, disciplined organization, they made visual sense. They held together beautifully. Bayformers derive from a very different design principle, one based on translating the idea of a Transformer into plausible reality. In reality, a complex machine would not retain whole elements of its form when transitioning to a different mode. The vocabulary, by necessity, needs to fracture into smaller “words.” Instead of a fender, the building block becomes a gear or a piston. The natural result of this is what we’ve seen in the movies, relatively plausible objects with a more homogenized appearance. Sure, there are variations of massing, but each character has become a marvelously detailed frame of whirring gears with a few colorful bits tacked on to remind you of the alternate mode. It’s a perfectly reasonable way of doing things, but it’s not my cup of tea. 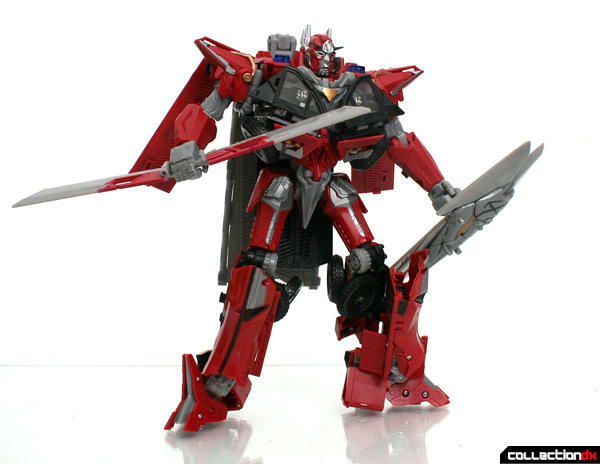 I picked up Sentinel Prime because he appeared to be more nuanced and refined than the movie Transformers I’ve seen. I like the colors and both modes looked pretty. 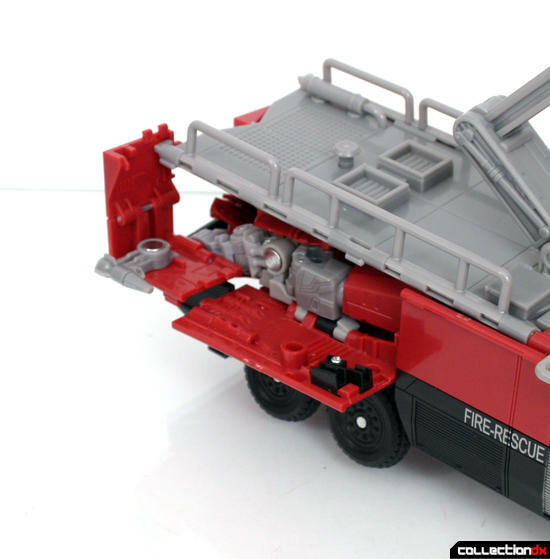 Sentinel comes in a large window box befitting a Ultra Deluxe Master-Class toy, or whatever they are calling the larger toys. The figure itself: beautiful; has real personality, presence and depth; WILL NOT STAND UP. I have a real problem with big expensive toys which cannot do the simplest thing a toy can do: stand up. But here we are again. The damned thing will not stand up without serious attention. I had to manipulate all kinds of joint to get the most basic poses, and even then he’s hunched in some awkward position. I really considered just scotching this review. I enjoyed the piece well enough when I was just playing with it and transforming it, but I hadn’t attempted to make it stand up on two feet before I photographed it. But I do in fact enjoy this thing, so onward and upward. He does look pretty, though. Though at first he appears to have a serious case of Transformer Back, his back is not that awful. The floating panels aren’t ideal, but make a certain sense, and he looks complete. Posing is solid, and Sentinel looks appropriately dynamic with his shield and sword. 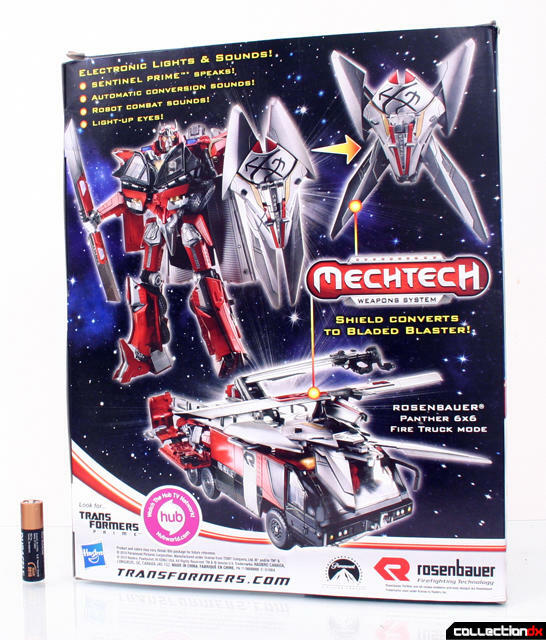 The shield is one of the figure’s Mechtech features. It will spring into a blaster of some kind with the touch of a button (see fire truck mode for details). 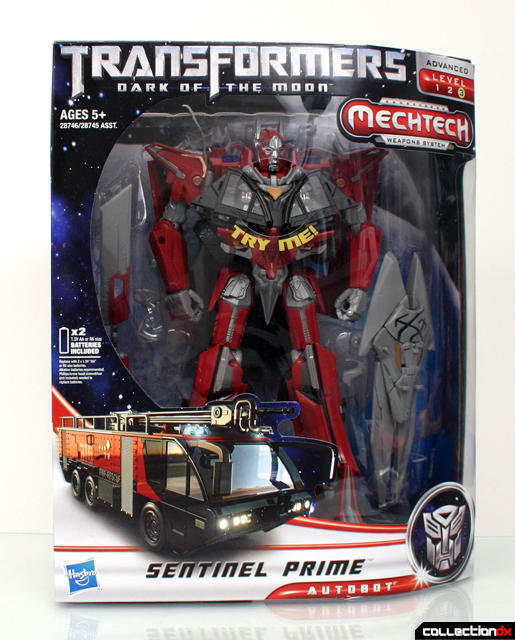 Another Mechtech feature is button-activation of Prime’s mouth, with accompanying flashing eyes and “I am Sentinel Prime” sound. It's a neat trick, but I don't really care. 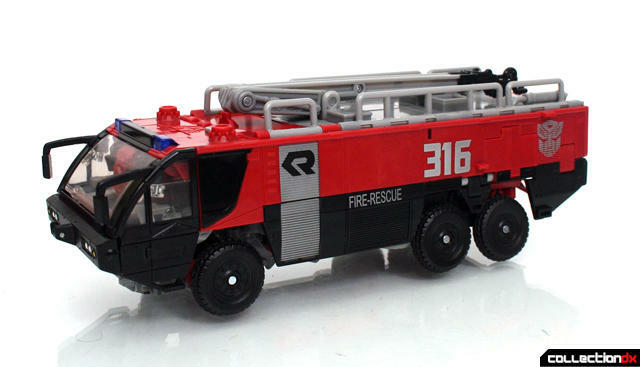 Transformation into fire truck is...involved. I just assume that a child these days can just grab this thing and transform it in seconds into the truck, but man I struggled with this. 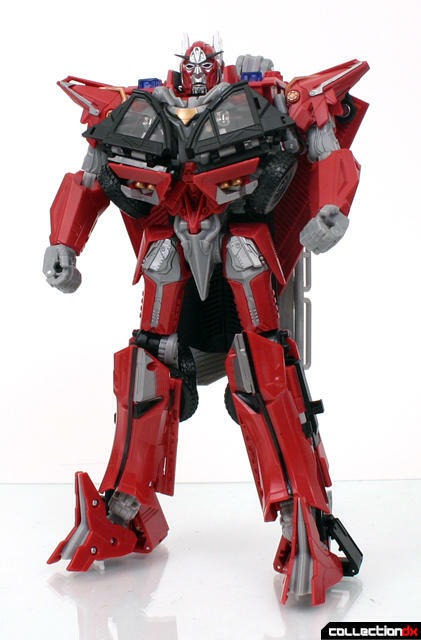 Sentinel Prime is essentially a very complicated shell-former. Getting his legs and arms to fit in that shell was a long, frustrating process. For most of my collecting life, I enjoyed and welcomed additional complexity in transformation. Now I’m over it. I appreciate an elegant, simple transformation more than a CAD-engineered wonder. When I fiddle with, say, Golion, I’m pleasantly engaged. When I get Sentinel Prime into one mode, I dread getting back to the other. I know it’s not going to be any fun. Maybe it is to a child today. 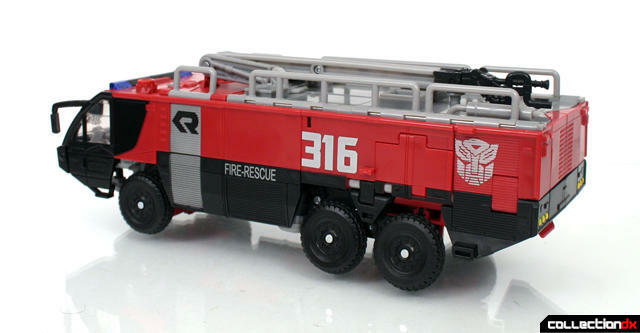 The result is a very handsome vehicle mode. Getting all of the shell panels in place is a hassle but it has its rewards. You don’t dare breathe on it though, lest the delicate balance of interlocking panels get disturbed and ruin the last twenty minutes of positioning. You can place the shield on the top for more Mechtech action. A few of the rear panels fold out. This toy is simultaneously nice and maddening. I really like both modes. Each is rich and well-detailed and a fun plaything. But the robot doesn’t stand. And transformation is no fun. Would I buy another Bayformer? Probably. The Shockwave looks nice, and it takes awhile for me to learn my lesson. Shockwave is pretty good, but you should try Skyhammer. It has a very non-Bayformer aesthetic, great articulation and stability, and an excellent alt mode. Shockwave's alt mode is a big Cybertronian block with a huge gun and blade. Apart from the face sculpt he's not a bad looking dude. Both modes look cool, especially his alt mode. Still won't be buying any of the Bayformers though. Agreed wholeheartedly. Sentinel Prime does fit perfectly with the modern G1 aspect of things. That's why I stayed away from certain Bayformer toys that objects that aspect. I think Roadbuster, Shockwave, & Skyhammer are good choices. I mean Shockwave is aesthetically cool looking than Megatron. I'll be honest. Very nice pictures, but that's about it. The rest I didn't like, especially as a person having over a month experience with this robot and actually reviewing it elsewhere already. 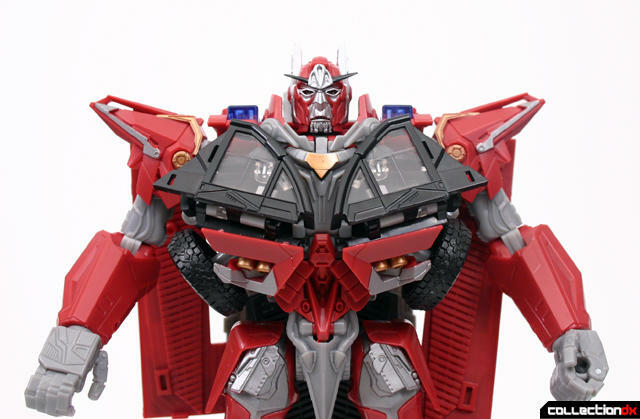 Robot mode- the back panel splits up to form a Vector Prime- like cape and the railings fold down. The robot DOES stand, you just have to click the groin joint back and knee joint forward by one click so from side it looks a bit chicken like. You didn't really discuss the weapons as much as I wished for, especially the fact the shield is very loose in hands and should be mounted on the forearm to stay in one place. 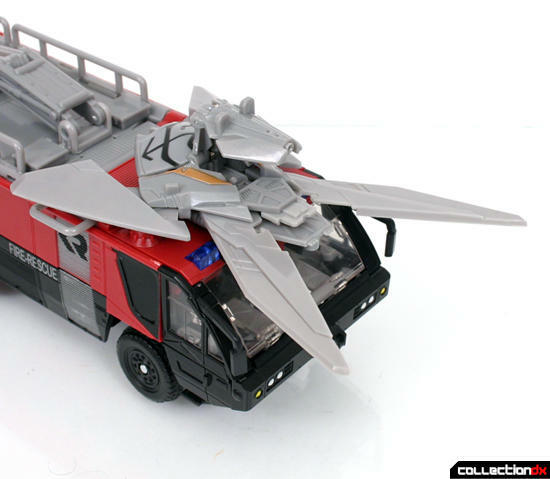 There was also no mentioning of how this toy is compatible with Generations/Hunt For The Decepticons 3,5mm weapon clipping system ( I assume you heard of this system as Generations is an extension of G1 in a way). 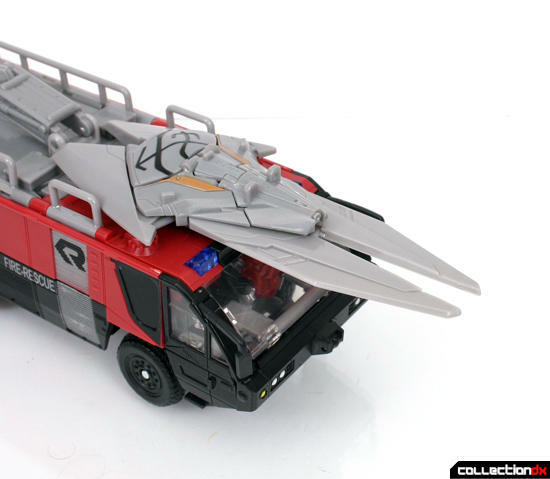 Vehicle mode- no mentioning of how the electronic works in this mode, nor how it's changing when you plug weapons into Sentinel's roof. Also, you didn't mention the deployable front bumper water gun, nor how main weapons can be stored inside the vehicle (blades in the leg compartment and the shield on the undercarriage. I agree getting him into car mode is tricky, but you can see SOC Daimos-like traits in here with arms stored in legs in alt mode and admittedly the engireering of this transformation is quite nice seeing what goes where. I appreciate the constructive criticism, and I'll take it into account if I review another one of these. My brevity is mostly because I know there are dozens of other reviews (like your own, no doubt), which delve into these toys in incredible detail, and I'm more interested in providing a certain point of view than duplicating or amplifying these efforts. But, again, a valid critique. Hello Wallas, it's fair to note that JoshB did an average review of TF Generations Cyclonus just like this one b/c of the heavy traffic of reviews that covered the robot w/ a thorough analysis about it on the world net. He even made note to his readers about this on his short-lived review. So there's really no point in emulating one's in-depth reviews on the subject. That's why I think film critics Siskel & Ebert had the right approach to modern criticism: If you want to honestly criticize a subject to your audience, give them a natural reaction to it. Why not, I'm looking forward to critic. Ok, next time I'll send my points over a PM. But for me there is a difference between "I don't like this because I'd do it in a different way" and "I don't like it because it skips the selling points and key features of the toy". My response was aimed to show there is much more to this toy than the article suggests and not to be nasty to The Enthusiast ( and I'm happy to see he accepted my points as valid,). Despite what you might've interpret from my comment, I don't enjoy purposefuly trolling others or being a prick showing his superiority. I enjoy seeing toys in their full glory. Let's leave it at that because I'm not bent on creating flame here, just wanted to clear why I wrote what I wrote. Again, next time I'll transfer my technical suggestions via private messages. Dammit- I really wanna read this review, but I can't because it'll be a spoiler! 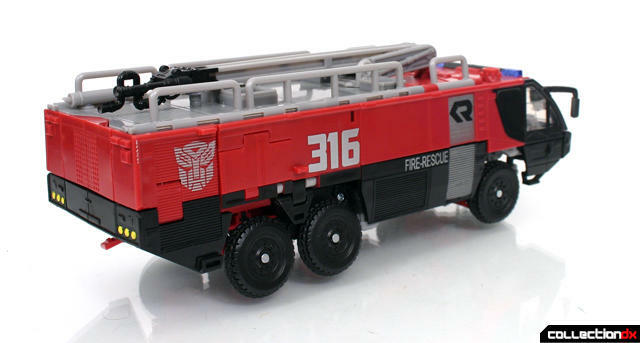 >_<; ...It's bad enough I know he's a fire truck and called Sentinel Prime. I'm not talking just about story when I said that. The fact I even know he exists, who voices him, and what he changes into is spoiler enough. But I don't want to know what he looks like or his features until I see it for myself. 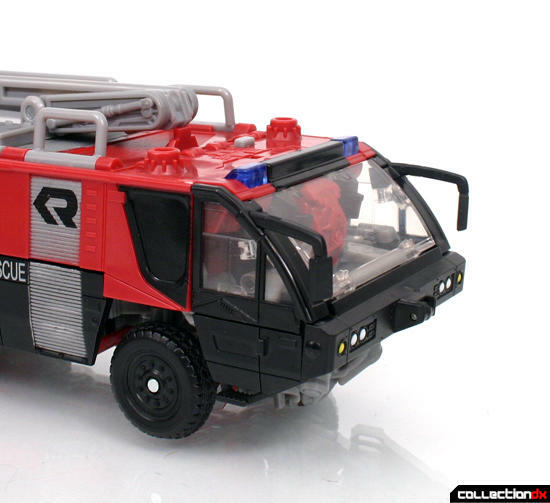 I got Leader Ironhide (review in progress) because he was a recurring character from past movies, and we don't know 100% yet if what his features are will be in DotM or not. Do you honestly believe that TF 3 is going to surprise you? It's Transformers not the bleedin' Wickerman. Well, I burned myself on spoilers 16 years ago, and have regretted it ever since. I learned my lesson. I'll watch trailers 'n such because they don't reveal too much, and they're usually out-of-context as trailers usually are. But that's the extent of it until I see [any] film with my own eyes. That goes for more than just Bayformers too, BTW. Even trailers are far to revealing these days, every time an add on TV flashes on (for a film I'm interested in) I look away & mute the volume, it's worth the trouble. That's because Michael Bay films often don't need deeply-complex and -moving plot lines to be entertaining. Take, for example, his first film, "The Rock". To this day, that is still my favorite Bay film. (It's also the only film where I like Nick Cage being, well, Nick Cage on the screen. Jack Nicholson he ain't.) No one- including myself- ever said he did non-action-based character drama well. He's an action film director, and he has a good- albeit not impenetrable- eye for what will get your blood pumping. 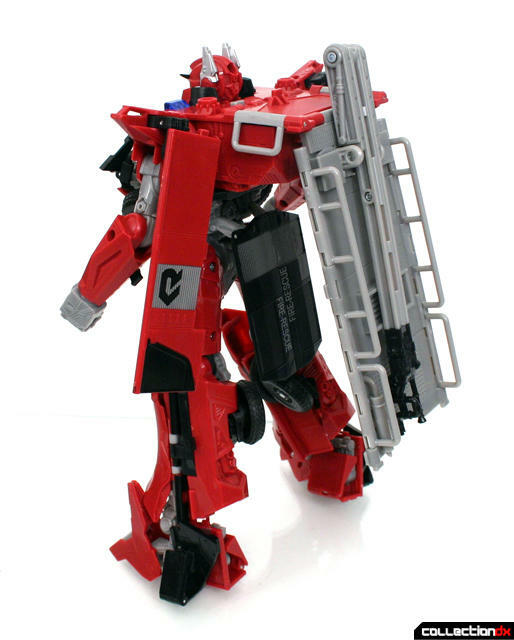 IMO, Bayformers-1 is a close second, and "Armageddon" is a distant third. Don't see The Island. Trust me. All of those movies are terrible. What is it with sequels? Even though I have read or watched a half-dozen other reviews of this toy, I enjoyed this one for its fresh and honest perspective. Yeah, there are missed features and a few transformation issues, but I think that first impressions are valid info to share, and I enjoyed reading them. Furthermore, the synopsis of the differences between the G1 aesthetic and the Bayverse aesthetic was spot-on and very well-stated. I happen to like the Bayverse look (even if I don't care for the movies), but I grew up on G1 and I appreciate that, too. As the review suggested, Bayverse characters are usually hyper-complex shell-formers, and whether you like that or not comes down to personal opinion. Like many sequels, Sentinel shares a lot of the look of the original, but misses something of the spirit. The RotF Leader Prime is just plain dumbfounding in how good each mode is, and how complicated it is to get between them. As a truck, he's rock-solid, not a frustratingly fragile mess of panels. And s a robot, it's almost impossible for me (after owning him for about 1.5 year) to see how he could possibly turn into what he does. The complexity is worth the end results. 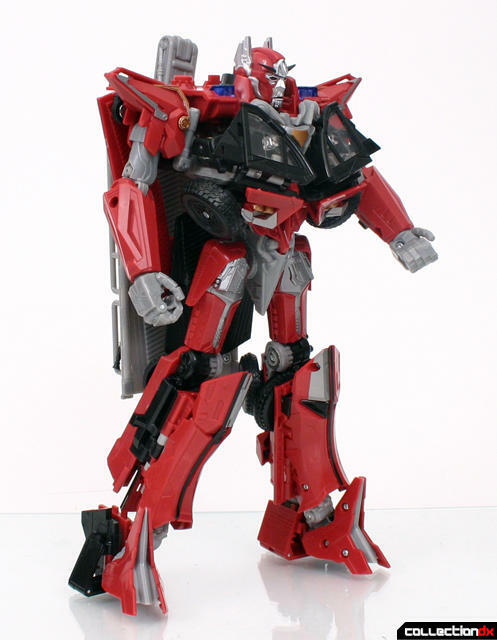 I guess my point is that I'd love to see an Enthusiast comparison between this toy and RotF Leader Prime. 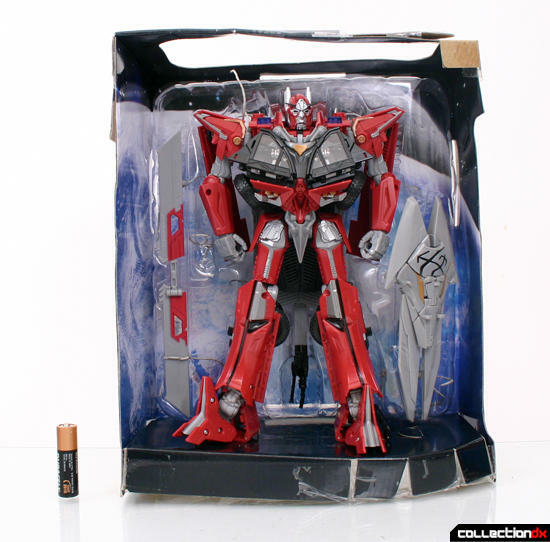 If it helps, a version of that Prime with Energon Hooks and "Battle Damage" is making the rounds at second-string U.S. department stores for seriously discounted prices. thanks for the thoughtful remarks. I might have to check out that Prime. I have been giving it the eye. If I pick it up I'll blog an update. It has a Dunbine look to it, especially in the leg section. All it needs is a bug face. It occurred to me that if I didn't move soon, I would loose my chance to get some of these DotM figures before they moved on to Wave 2 and/or "TF Prime". I reminded myself that several times I have gotten toys of characters I didn't like (ex: The Twins) just because the toys themselves were good. 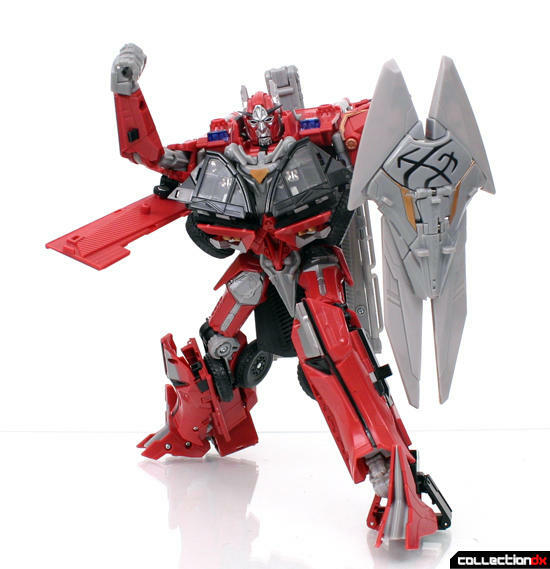 And so I knuckled under and got Sentinel Prime last night. I'm not gonna repeat all of what everyone else has pointed out above, but I do still wanna give my $0.02. I see what you meant about not breathing on the panels. 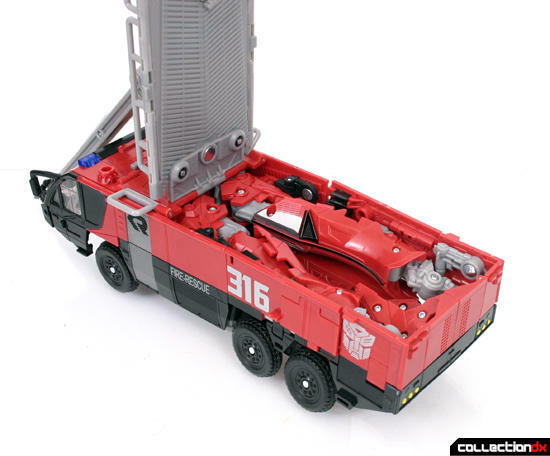 While vehicle mode is rather panel-centric, I'd say that didn't bother me too much even though I agree with the part about them being quite finicky to align together. Other than the panels, the transformation was quite engaging, and I love how all the panels and techy stuff moves about inside his torso. I also though placing the arms inside the legs was quite a cleaver way to conserve space and not increase the cost by having those disassemble even more (nice as that would be too). 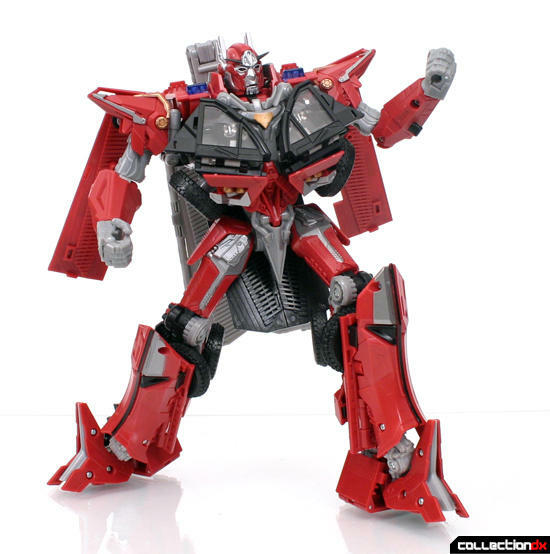 IMO, the standard by which all other Leader-class Bayformers should be judged is still RotF Optimus Prime. I think Sentinel here does a very good job of keeping his features, details, and transformation to that same level without being as frustrating the first time through (even though, yes, those panels get annoying). I, too, also had balance issues, but these worked out by making him slightly chicken-walker at the knees, and opening-up and playing around with the panels on his back-side. --It sounds nothing like the guy who played him in the movie. --The eyes glow the wrong color. For the love of God, Hasbro, wake up on these two issues.